Make A Special Impact on Your Loved Ones at Valentine’s Day! Name a crater on Mars for family, friends, or loved ones on our Mars map! 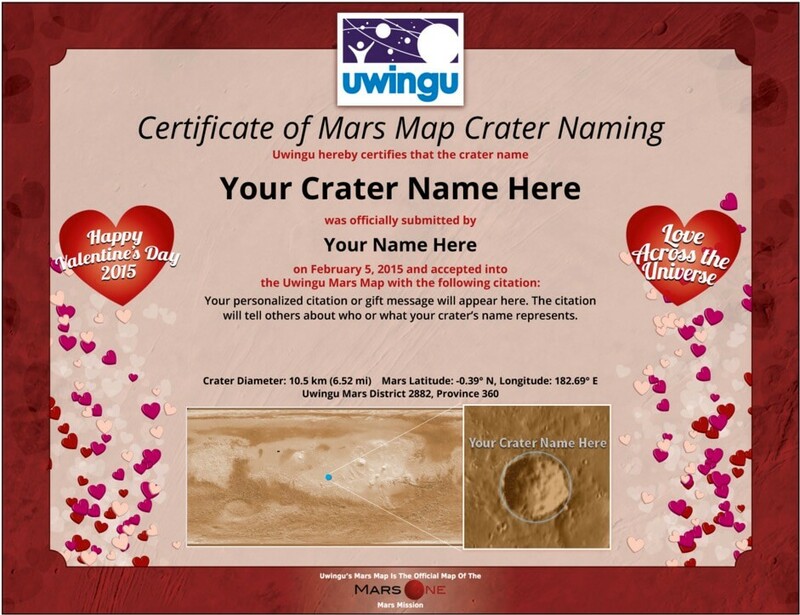 Each crater named receives a special Valentine’s Day certificate. Name an exoplanet around another star for family, friends, or loved ones. Send a yearlong gift subscription to family, friends, or loved ones to space image of the day service, a Valentine’s that keeps on giving! Uwingu is a for-profit, public engagement space company based in Boulder, CO, led by senior planetary scientists and astronomers. Uwingu’s twin missions are to connect the public to space and space exploration in new ways, and to create a grant fund to support a wide range of space efforts by individual space researchers, educators, and organizations.